There is no need for you to untangle those old Christmas lights this year. Let our Christmas light installers hang them for you- whether you’d like to see them across the top of your home, surrounding your windows, or wrapping your trees, so you can relax and enjoy the festive season with friends and family. In addition to holiday lighting services, we also provide festive urns, giving you magical curb appeal and expressing your love for the season. 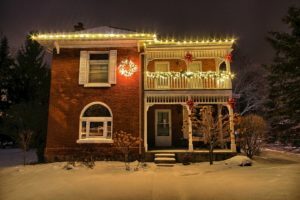 Holiday décor is an important part of the winter season for many people, but installing your outdoor decorations can be exhausting and dangerous, and it can sometimes be difficult to fit into your schedule during this busy time of the year. It is also a painfully tedious job that will look unappealing if not done well, and it’s not over once you’ve completed installing- you still have to worry about taking them down. Our specialty equipment & professional Christmas light installation team can safely reach all points of your home, allowing you to have lights in places that you haven’t been able to access before. If you’ve always wanted your front yard trees to be lit, but you’ve been hesitating to get out the ladder, we can make it happen for you. Note that holiday services start at $300. You can add a touch of elegance to the entrance of your home with our outdoor arrangements that use evergreens, branches, holly berries, and more. Instead of transporting containers and plants to and from your home, allow Moon Glow holiday lighting services to take care of the details so that you can enjoy the end product. Start looking forward to the festive season, and request a consultation today for holiday lighting and urns.